According to MedicineNet in "Definition of Heat Stroke," heat stroke occurs when the body's core temperature rises above 104°F (40°C) and is accompanied by hot, dry skin and central nervous system abnormalities such as delirium, convulsions or coma. Since heat stroke is a life-threatening condition, it is important to watch people for heat stroke symptoms. MedicineNet states that heat stroke that results from exposure to high environmental temperatures is termed nonexertional heat stroke, and heat stroke that results from strenuous exercise is called exertional heat stroke. Regardless of the type of heat stroke a person experiences, heat stroke signs are life-threatening, and immediate medical attention is necessary when heat stroke symptoms begin. When the body cannot control its temperature, heat stroke occurs because the sweating mechanism fails. The body is not able to cool down. Body temperature can rise to 106°F (41.1°C) or higher within a few minutes. Heat stroke is an extremely dangerous condition and can cause permanent disability or death, so it is essential that heat stroke victims receive emergency medical treatment. While heat exhaustion has similar symptoms to heat stroke, the difference between heat exhaustion and heat stroke is when a person has heat stroke her body temperature reaches 104 F (40 C) or higher. 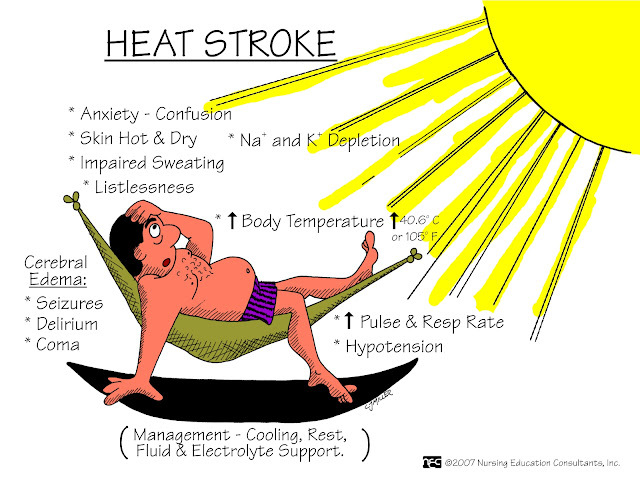 Heat exhaustion can lead heat stroke if not treated in time. Heat exhaustion can also occur just from physical exertion regardless of environmental temperatures. If a person is suspected to have heat stroke or has symptoms of heat stroke, it is essential to get emergency medical treatment immediately. According to MedicineNet and MayoClinic it is important to cool the stroke victim rapidly and get him out of the sun to a shady area. It is possible to cool heat stroke victims by immersing them in cool water. It is also possible to cover the person in a wet sheet, especially if humidity is low, or sponge him with cool water. If a heat stroke victim is able to drink, give him water or other nonalcoholic beverages. People should monitor the body temperature of heat stroke victims and continue to cool down their body temperatures until their body temperature drops to 101-102°F (38.3-38.5°C). If emergency personal are delayed, it is important to call an emergency room or medical expert for further instructions. According to the MayoClinic, heat stroke is caused by exercising or physical exertion performed usually out in the sun or in extreme heat combined with inadequate fluid intake. Dehydration is another cause of heat stroke. A person who is dehydrated may not be able to sweat fast enough to dissipate body heat. Infants and young children, the elderly, obese people, athletes, outdoor workers, people with an impaired ability to sweat and people who drink alcohol or take certain medications are more prone to heat stroke. Sometimes heat stroke can mimic other health conditions like heart attacks. While there are many different signs and symptoms of heat stroke, a high body temperature is the most common. Anyone suspected of having heat stroke should given emergency care immediately.